Food Industry News: Election Pains or Gains? Home / Articles / 2012 / Election Pains or Gains? If the State of the Union address in January 2013 were dedicated solely to the state of the food and beverageindustry, the incoming president would surely touch on the obesity crisis, food deserts and the continuing battles over school lunches and the size of soft drinks. He would discuss the drought-ravaged crops of 2012 and what they mean for farm policy, ethanol quotas and food prices. He would discuss regulations – needed or not needed – in regard to food safety, labeling of genetically modified foods (GMOs) and health claims. Maybe even overarching business issues such as worker safety, health care, the tax code, trade policy and the economic pressures that food companies face. While Mitt Romney's "State of the Food Union" speech and calls to action would surely differ from Barack Obama's, the question is how much it will matter who's in charge as the rubber of political reality hits the road in the next four years. Some food industry leaders say the performance of the Obama administration over the past term reveals stark differences in how he would continue to lead versus a Romney administration. But they acknowledge continued gridlock in Washington and struggles related to the economy that could water down efforts of either commander in chief. And they point to developments at the state and local levels that could be just as challenging – and perhaps even more influential – than pronouncements from the White House. When asked about differences between Romney and Obama, industry leaders note there clearly has been a trend toward more restriction on what food and beverage companies can do and say under Obama, and there might be less regulation and less pressure under Romney. "Certainly on the regulatory front it will make a difference if Obama or Romney is in office," says Connie Tipton, president and CEO of the International Dairy Foods Association. "This administration – as well-intentioned as it is on diet and obesity – is prone to take a prescriptive approach, which ends up limiting choice. "There are a lot of things in the pipeline that could be affected, such as front-of-pack labeling and revision of the nutrition facts panel," she continues. "We don't know for sure where Romney would be on some of these issues, but it's a pretty sure bet that his administration would be less prescriptive." "I've always been an advocate of less government," says Paul Kruse, president and CEO of Blue Bell Creameries, a Brenham, Texas, maker of ice cream. "I think the two nominees are very far apart in that respect." 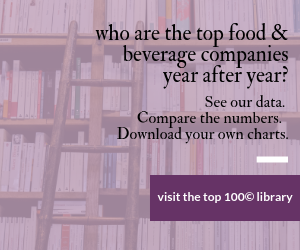 Sue Pittman, who heads the Food & Nutrition Affairs Practice at FoodMinds LLC, agrees that regulators have weighed heavily on food and beveragecompanies in the past four years, but notes that she's seen an evolution in the Obama approach. "The administration appears more aware of the issues the food industry faces. We see that even in Mrs. Obama's tone when she speaks," Pittman says, referring to the leadership role Michelle Obama has attained in discussing relevant food issues. While what the First Lady says in the White House garden may seem a far stretch from what takes place down the road at the FDA or USDA, Pittman says that the language used in the "whole, fresh, local" efforts has a definite effect on policy discussions. And the end result is an assault on processed foods. Pittman believes this broader food movement – particularly in terms of the engagement of local communities – has enough momentum that even under a Republican president the pressure toward more regulation would not subside entirely. She points to the proliferation of local food policy councils, attempts to tax soft drinks and GMO labeling ballot initiatives. "I think with a Republican White House we would see more activity at the state level," she says. "There's so much momentum now in the states where the goal is to advocate for healthier food environments at the local level. That's not going to stop." The New York Times Magazine food columnist Mark Bittman recently lamented that this local food movement was, in fact, not nearly strong enough and needed to be energized significantly to push for national policy changes. "When Obama has been pressured on issues like gay rights, immigration and the Keystone XL pipeline, he's responded positively," Bittman wrote in an August column. "But he hasn't been pushed on food, and as a result has not followed up on campaign promises like his vow to label foods containing genetically modified ingredients, nor has he used his bully pulpit to try to protect SNAP (food stamps) from the ravages of Congress. Since there isn't a real food movement — yet! — progressives haven't made Obama do much." It does appear, however, that consumers consider food issues to be politically relevant, and are looking to food companies and the government to do more to protect their health and prevent obesity. A survey conducted by FoodMinds, "Food Temperance in America," tracks opinions on food policy topics among registered voters and opinion leader shoppers (a group of politically aware and socially active consumers). A key finding from the most recent survey conducted this spring demonstrates the political divide: 75 percent of Democrats think more time should be spent on food policy topics within presidential debates and in overall discussions about government policies, while only 39 percent of Republicans think so. What's more, an increasing number of these opinion leader shoppers think Americans need support from their public institutions and the marketplace in their personal battle against obesity. Most (56 percent) said they believe that the individual holds primary responsibility for making healthy choices to prevent obesity. But the flip-side is that 44 percent believe that this primary responsibility lies somewhere else – not with the individual. Most startling, this is a 9-point increase over two years ago – when only 33 percent of respondents felt this way. The other places increasingly saddled with the responsibility for helping us make healthy choices, in their opinion, are food companies (10 percent), U.S. government (14 percent), the health care system (12 percent) and the educational system (8 percent). Further demonstrating the party divide, 67 percent of Republicans, but only 48 percent of Democrats, believe primary responsibility regarding healthy choices falls to the individual. Romney's campaign so far has been short on details, and food issues are no exception. One thing clear, however, is his distaste for regulations that hamper business. "On his first day in office, Romney will order all federal agencies to initiate repeal of any regulations issued by the Obama administration that unduly burden the economy or job creation," reads a broad statement within Romney's economic plan. The plan also says the rate at which agencies could impose new regulations would be capped at zero. "If an agency wishes or is required by law to issue a new regulation, it must go through a budget-like process and identify offsetting cost reductions from the existing regulatory burden." As for Obama, regulation of the food industry under his watch has included stricter proposals on how foods are marketed and sold, including proposals – and in some cases new rules – involving marketing to children, menu labeling, competitive foods in schools and labeling reform – both on the front and back of pack. However, many of the regulatory rules behind these initiatives are on hold, likely due to the inevitable freeze-up caused by election year politics. This has been particularly frustrating for some in regard to the Food Safety Modernization Act, a major piece of legislation signed by Obama in January 2011, and called the most ambitious overhaul of the nation's food safety system since the 1930s. While the bill passed with bipartisan support and backing by the Grocery Manufacturers Assn., the draft regulations to implement the law have been stuck at the Office of Management and Budget since early this year. Recent editorials in both the The Washington Post and The New York Times called for Obama to dislodge the stuck regulations. Food companies beef that Obama regulators have been over-active and overly intrusive, and not necessarily in a consistent fashion. "I think there has been a problem, both from the administration as well as Congress, in giving the business community predictability," says Kruse of Blue Bell Creameries. "We like to know the rules and that has been lacking. It does seem as though the regulatory area has been very active and consumes a good portion of our time and resources. "As a lawyer and employer, it appears to me that the NLRB [National Labor Relations Board] has been making surprising pronouncements," he adds as an example. "I have no idea what is coming from them next." Pittman agrees that the uncertainty in regulatory action has made it difficult for food companies, particularly as some try to modify their offerings to respond to obesity and health concerns. "If I make some changes to a product, will it matter?" she asks. "Industry tries to go some new direction, and the bar changes." Another high-level executive who recently left a major U.S. food company, and who spoke on condition of anonymity, agreed that the Obama administration has been "much more inclined to impose regulation." "They've been more willing to pull the trigger on action. The Bush administration was also very involved, but where they tended to ask for information, the Obama administration seems more inclined to take action that is anti-‘Big Food,' " he said. He pointed to the Dept. of Justice's antitrust efforts as a particular example, saying it brought growth and job creation to a "screeching halt". "The Obama Administration and some members of Congress have not been particularly good for companies that want to grow," he said. It's not necessarily a matter of a Democrat or Republican in the White House, he added. "The industry thrived under Clinton for eight years. He was very pro-business, but Obama – or the people around him – have taken a different approach." Another issue that could be impacted by who ends up in the White House is the proliferation of food litigation. The past four years have seen an increasing barrage of lawsuits against the food industry for everything from mislabeled products to misleading health claims. The New York Times recently reported that in the past few months alone, more than a dozen lawyers who used to work in the area of tobacco litigation have filed 25 cases against food companies including ConAgra Foods, PepsiCo, Heinz, General Mills and Chobani. The Federal Trade Commission has likewise filed suits and won settlements from companies such as Dannon and Pom Wonderful, charging that the companies couldn't substantiate certain health claims on their products. This is another area, the Times article asserts, where state and local governments are being drawn into the battle due to the escalating costs of health care for people with diabetes, cardiovascular disease and other health issues related to obesity. It could be that an Obama administration would foster continued growth of such activities, including in the appointment of judges, while a Romney administration might prove a less hospitable environment to what many consider frivolous lawsuits. "Our legal system, with its framework of litigation and liability, serves as another form of regulation faced by both individuals and businesses," reads Romney's economic plan. "As president, Mitt Romney will pursue reforms that respect the federal-state balance of power in our court system while creating a legal environment conducive to economic growth." Beyond issues focused on the food sector are broader concerns that have just as much – or more – impact on food businesses. "Immigration, health care, taxes, entitlement programs – big things have to get dealt with," says IDFA's Tipton. "We haven't seen the leadership from Congress or the administration that we need." Adds Kruse, "Commodity and food costs, the Farm Bill and energy policy are all items of concern for us. All are affected by the weak U.S. dollar. Let us hope we see a plan by the next administration to lead in these areas." Still, there's no guarantee that either candidate could break the gridlock and acrimonious mood in Washington. Food industry leaders, who for years have lobbied successfully in a bi-partisan fashion, lament that there is no spirit of compromise, and that the overriding consideration isn't the issue itself, but "will it hurt or help the Republicans or the Democrats?" "The word I get – and from visiting there myself – is that everyone is of the opinion that partisan politics have reached unseen heights and I think this is something very bad for the American people," says Kruse. "We need to find a new page to work from." It's unlikely Romney or Obama could untangle Washington gridlock anytime soon, especially if the Senate and House majorities are not of the same party as the White House. This could spell trouble for some campaign pledges to move initiatives quickly through Congress. So, as we approach Election Day, the picture is of a current Democratic president who might learn to soften his approach to business, and of a Republican contender who promises less regulation – all within a setting of contentious politics in Washington and a relentless drive for more regulation from consumer activists at the state, local and national levels. Regardless of who wins, food companies will have to keep their guard up concerning the regulatory environment and – like every other industry in the world today – hope and work for leadership that brings better economic days ahead.